The WATTS ACV One Way Flow Altitude Valve with Pressure Sustaining Feature is designed to open, allowing flow into a reservoir or elevated storage tank (tank fill), and close drip tight when high water level is achieved. 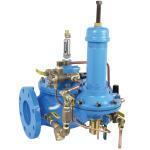 The valve also throttles to sustain a minimum upstream pressure during tank filling operations. It controls water level by remotely sensing static tank head pressure through a field installed sensing line, and opens when the water level is below the adjustable setpoint and closes drip tight when the level is above the adjustable setpoint.